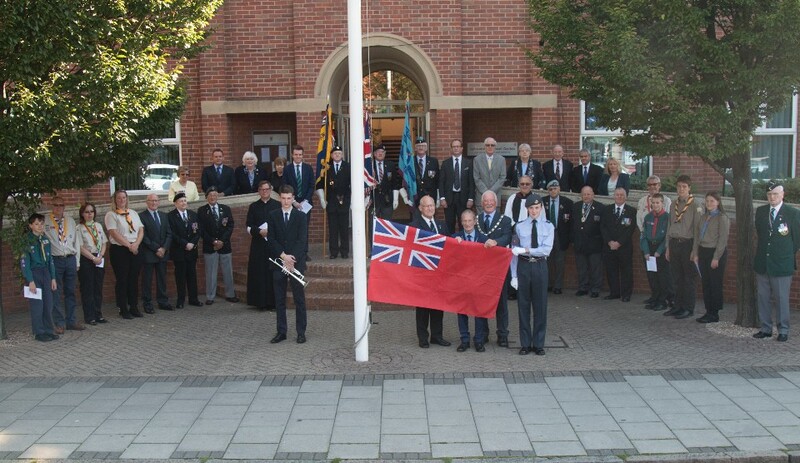 South Kesteven District Council joined hundreds of organisations across the nation to raise a special flag in honour of Merchant Navy Day last week. Vice-chairman Cllr George Chivers led a ceremony outside the council's offices in Grantham on Friday 1 September. A special red navy ensign flag was raised following a minute's silence to remember the brave men and women who served in the Merchant Navy in both World Wars. The national day, which has run since 2000, also shows the UK's continuing appreciation for its modern-day merchant seafarers. Cllr Chivers was joined by the Merchant Navy Association Chairman Captain John Sail, Council Chairman Cllr Bob Sampson, The Leader of SKDC, Cllr Matthew Lee, Deputy Leader Cllr Kelham Cooke, The Royal British Legion, Royal Air Forces Association and Malaya and Borneo Veterans Association. Representatives from Grantham Scout and Guide groups were also in attendance and the Last Post and Reveille was sounded by bugler Chris Standen. A Sea Farer's Poem was also recited by Captain Sail, prayers were offered by The Reverend Father Stuart Cradduck from the Parish of St. Wulframs and The Reverend Stuart Hadley, Rector Designate of the South Cliff Villages Group. Cllr Chivers, said: "We were proud to be among the many councils to raise a flag to mark Merchant Navy Day. It is always a very poignant ceremony and an opportunity for us to show our gratitude and respect to those that sacrificed so much."